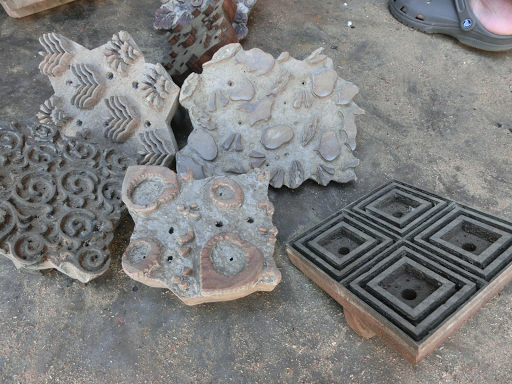 We went to a woodblock printing and dyeing workshop today just outside of Jaipur. 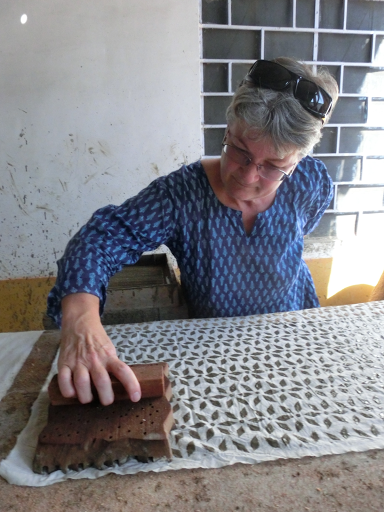 We printed fabric using a mud mixture which was then sprinkled with sawdust to help dry it. When fully dry it was put in the indigo bath. We also printed with black ink made using natural black ink made from lumps of rusting iron fermented with sugar cake for 8 weeks in a black pot in a hot place. The fabric had to be ore mordanted with myrobolan which is a strong tannin. Woodblocks for mudprinting. The recipe for the mix is mud, gum acacia, flour made from spoiled wheat. The indigo vat is 10 ft deep.